In the hymn Novalis exalts the night as the entrance to the house of the Blessed in which the secret of Eternity is revealed to man, who is condemned to his daily labour, by yielding to its cleansing effect. The opening question is: Must the morning always return? Will violence in the World never end? Through evil activities we fail to notice the heavenly approach of the night. Will the secret sacrifice of love ever burn for good? For the light – the day – time is measured; the rule of the night is without time or space, forever is the duration of holy sleep. Fools misjudge it and only experience it as the shadow the true night casts over us full of pity. They do not feel its presence in the golden flood of grapes, in the magic oil of the almond tree, in the brown juice of the poppy. They do not realise that it is the night that embraces the bosom of a dainty maiden, making her lap a paradise; they do not suspect that the night rises from old tales as the key to heaven. In order to come to a better understanding of the often difficult text, in above mentioned letter to Smulders (written shortly after starting the composition on 4 October) Diepenbrock referred to a French translation by Maurice Maeterlinck (1862-1949), which he said had clarified much of the obscurity of the original . (BD III:157) Soon after completing the whole work on 6 November 1899, Diepenbrock gave Smulders an overview of the thematic material (see BD III:165-167). Completing the orchestration and writing a neat copy would still take more than a month. Suddenly in m. 43 (see the Incipit) a trumpet calls, as if the dawn breaks radiantly, thus heralding the activities of the day. This is followed by a short, lamenting motive in the trombones and tuba, introducing the question: “Muss immer der Morgen wiederkommen? Endet nie des Irdischen Gewalt?” Supported and alternated by musical material from the orchestral introduction, the declamation of the first part of the text ends with the words “Zeitlos und raumlos ist der Nacht Herrschaft”, followed by the partial repetition of both of the musical sections from the introduction. Then the lamenting motive becomes the basis for an independent episode in the orchestral interlude. However, the mood changes with the introduction of an ecstatic theme that prepares the listener for a new reality: “Ewig ist die Dauer des Schlafs!” (Forever is the duration of sleep). The uninterrupted flow of music accompanies the rendition of the second half of the text; only when those who are insensitive to the language of the supernatural are mentioned, reminiscences of the introduction are heard. After the orchestra has presented the ecstatic theme, the trumpet motive reappears and the following words are repeated: “[Sie] ahnden nicht, dass aus alten Geschichten du himmelöffnend entgegentrittst, und den Schlüssel trägst zu den Wohnungen der Seligen, unendlicher Geheimnisse schweigender Bote.” (They never suspected that it is you opening the doors to heaven, that comes to meet them from ancient tales and that bears the key to the dwellings of the Blessed, silent messenger of endless secrets.) Then little by little the evening falls. The lamenting motive dies away as the last call of a bird that flies past, and against the murmuring repetition of the words “unendlicher Geheimnisse schweigender Bote” the night covers us with his cloak. The first performance was supposed to take place under Mengelberg’s baton alongside the hymn for soprano Gehoben ist der Stein on 27 June 1900, but it was cancelled as the programme of the third festive concert of the Nederlandsche Toonkunstenaars-Vereeniging (Dutch Musician’s Union) in the Centre of Arts and Sciences in The Hague contained so many works that the musicians would not be able to catch the last train back to Amsterdam. So Muss immer der Morgen wiederkommen was premiered on 6 December 1900 by Pauline de Haan-Manifarges and the Concertgebouw Orchestra conducted by Diepenbrock, who replaced Mengelberg who had suddenly fallen ill (see RC 49). The press was considerably less enthusiastic about the hymn for alto than about the hymn for soprano. Several critics commented that the voice of the soloist was regularly covered completely by the polyphonic texture of the orchestra. 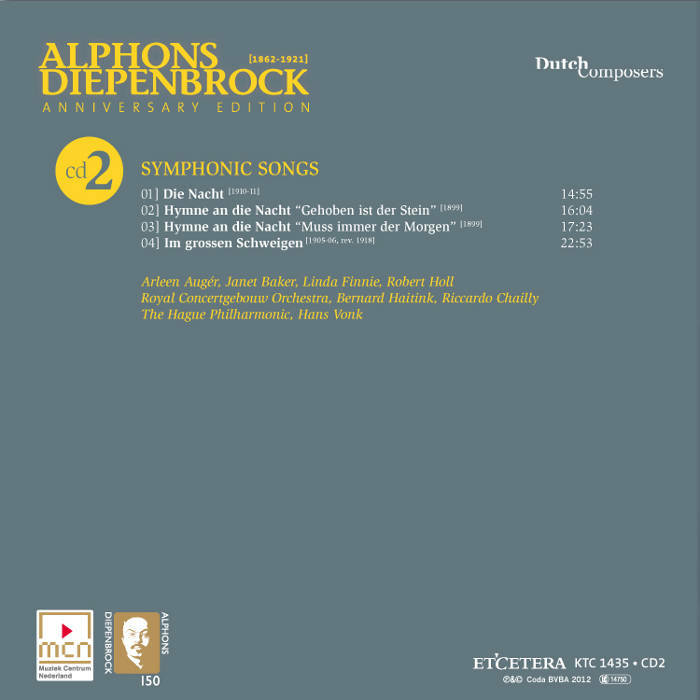 In order to prevent the vocal part from being lost, already in the autumn of 1900 Diepenbrock had been working on refining his original orchestration. He did this so thoroughly that the corrected orchestral parts were only ready just before the first rehearsal. Also before the performances under Mengelberg on 28 and 31 January 1901 (in Rotterdam and Amsterdam) the composer was still fine-tuning the hymn. As a result – according to an entry in the diary of his wife: Now one could hear every note of the lovely declamation. (BD III:588) Elisabeth’s observation is confirmed by a review by Antoon Averkamp; he wrote that all things in Muss immer der Morgen wiederkommen sounded so subtle, that now Mrs de Haan-Manifarges could effortlessly declaim her part with great clarity; only the low notes might every now and then have been drowned out somewhat by the orchestra. (BD III:591) Even so, a year later Diepenbrock once more rewrote the score drastically, gratefully using suggestions by Charles Smulders. On 14 March 1902 the revision was completed. In the autumn of 1909 Diepenbrock found the ideal interpreter for this Hymne an die Nacht in the temperament, personality and voice of the Hungarian alto Ilona Durigo (1881-1943). She sang the work with the Concertgebouw Orchestra conducted by Willem Mengelberg in The Hague on 30 October and again the following day in Amsterdam. The contact they had during the preparations, rehearsals and performances was the beginning of a cordial friendship. Muss immer der Morgen wiederkommen is the only song by Diepenbrock for voice and orchestra of which the score was published during his lifetime. 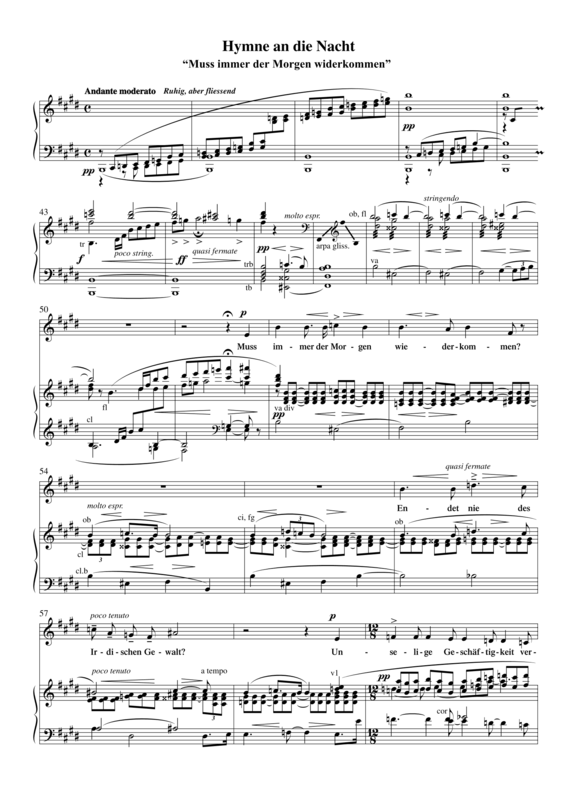 From the money his friends gave him for his fiftieth birthday in September 1912 towards the publication of his most important works, the piano score of the hymn for alto was published in August 1914 and the orchestral score in October 1916. In both editions, printed by the Braakensiek Brothers in Amsterdam, Diepenbrock included Maeterlinck’s translation alongside the text by Novalis. Endet nie des Irdischen Gewalt? den himmlischen Anflug der Nacht. Wird nie der Liebe geheimes Opfer ewig brennen? aber zeitlos und raumlos ist der Nacht Herrschaft. der wahrhaften Nacht mitleidig auf uns wirfst. und dem braunen Safte des Mohnes. unendlicher Geheimnisse schweigender Bote. Must the morning always return? Does the power of Earth never end? the heavenly coming of Night? Will love’s secret offering never burn eternal? eternal is the length of sleep. to those dedicated to the night. in that twilight of the true Night. in the brown juice of the poppy. a silent messenger of infinite mysteries. No. 1 begint met een inleiding, waarin uit de diepte opstijgende figuren in natuurtonen den Nacht schilderen, totdat de trompet een fan­fareachtig thema laat hooren, de kreet van den dag, en de Altstem in­treedt met de woorden: “Muss immer der Morgen wiederkommen”. Het thema van de klacht is door de bazuinen reeds te voren aangeduid en keert herhaalde malen weder. De geheele compositie vervalt in twee symmetrische deelen. Het 1e deel – tot aan de woorden: “aber zeitlos und raumlos ist der Nacht Herrschaft! — Het tweede begint met de woorden: “Kurz ist die Dauer” etc. Het hoofdthema van dit gedeelte is door omkeering uit de opstijgende natuurtonen van het 1e deel ontwik­keld en ligt steeds in het orkest. Het slot is geheel diatonisch op 3 klanks-harmoniën gebouwd en op het natuurtonenthema van het 1e deel. De stem dient meer om precies en met woorden uit te spreken hetgeen het orkest in de algemeene taal der instrumenten uitspreekt, en met die con­creetheid niet uitspreken kan. […] — Wat in de gedichten nog duister mocht zijn, zal Diepenbrock's muziek ons verduidelijken, beter dan dit door woorden zou gaan.